Founded in 1977 in San Diego, California, Arizona Tile has grown into a nationally recognized commercial and residential distributor with more than 26 showrooms throughout eight Western states. Arizona Tile is one of the largest independently-owned importers of stone in the United States, offering more than 230 varieties of granite, travertine, limestone, and quartz, plus mosaics, porcelain tile, and other design creations. Founded by John Huarte, former NFL player, and Heisman Trophy winner, the company is still family-owned after 40 years. At the onset of the new year, many people find themselves faced with the prospect of new projects or upcoming renovations. With so many options, choosing a tile or slab distributor can prove to be a daunting task. While this may be the case elsewhere, Arizona Tile contends with convenience factors by offering an endless variety of tile, quartz, and stone products, providing a true, “one-stop-shop.” With materials in stock and in more than 25 showrooms throughout eight states, available options are plentiful. To sweeten the pot, Arizona Tile is adding a plethora of new surfaces to our already extensive selection. Preview some of the most noteworthy new surfaces below, and get started by envisioning the reality of your new project, in all its glory. Tru Marmi is a marble-look porcelain tile that is offered in five stone-look shades. Named after their marble muses, each color delivers the luxurious appeal of marble while maintaining the durable characteristics of porcelain tile. As porcelain, minimal maintenance is required, making Tru Marmi an optimal choice for any installation. Palladio is a marble agglomerate tile. The term “agglomerate” means that it is comprised of small pieces of stone, fused together using resin. Therefore, it possesses similar characteristics of marble. Offered in a white and black option, the monochromatic palette caters to a variety of design styles, while its striking pattern adds a touch of retro charm. Reverie is an 8”x 8” porcelain tile that is offered in a variety of patterns and hues. Lending to the resurgence of vintage design, Reverie offers patterns reminiscent of years past. In spite of its aged appeal, Reverie pairs well with a variety of modern materials, creating installations that are both charming and unique. The Aequa Series is a rectified color body porcelain that gives the appearance of reclaimed wood. This series provides the warmth of timeworn matter that has taken on new colors and nuances over time. Aequa Series is available in two sizes, 8”x32”x10mm and 12”x48”x10mm. It is available in five colors and two finishes: standard and R11 Anti-Slip Finish. The R11 Anti-Slip Finish is specifically designed for outdoor, exposed areas, as well as wet applications, including shower floors. Vintage is a Brazilian granite characterized by a variety of large, striking crystals strewn across a milky quartz background. Crystals comprised of feldspar and biotite are accompanied by varying flakes of mica, giving the material an exclusive, unique appearance overall. Arizona Tile carries Vintage in 2 and 3cm stone slabs. Vahalla is a granite also sourced from a bedrock quarry in Brazil. Its creamy white background provides a muted backdrop to large biotite crystals dispersed throughout the slab. The high contrast of colors within this slab add a distinctive allure while staying true to its organic appearance. Arizona Tile carries Vahalla in 2 and 3cm slabs. Statuario Nuovo is a warm white quartz with unique, taupetoned patterns that resemble veining. The natural look of this quartz adds visual interest while complimenting a wide array of installations. Arizona Tile carries Statuario Nuovo in 2 and 3cm slabs. Aluminum-N is a grey quartz with static fl ecks of pebble grey detailing. Its consistent design provides a sleek, unassuming component to modern and traditional installations alike. Arizona Tile carries Steel-N in 2 and 2cm slabs. Steel-N l is a cool grey quartz with small fl ecks of clear and mirrored detailing throughout. The uniform pattern of Steel-N is noticeable at any angle and adds texture and dimension to the solid grey background. Arizona Tile carries Steel-N in 2 and 3cm slabs. the versatility of porcelain products continues to expand; a feature most notably demonstrated by the 2018 release of Arizona Tile’s new R11 Anti-Slip Finish. The R11 Anti-Slip Finish is specifically designed for outdoor, exposed areas, as well as wet applications including shower floors. With R11, flooring installations can be truly seamless; bringing the beauty and design from the interior of a space, to its outdoor living areas. To be certified as R11 Anti-Slip, a tile must pass an internationally-recognized analysis showing that a barefoot person can maintain balance while standing on the wet tile at an incline of up to 27 degrees. This advanced technology increases the versatility of porcelain applications and enables it to be safely used in areas that regular porcelain installations might prove hazardous. The added safety benefits add value to the series that offer R11 Anti-Slip Finish and make it an even more appealing option for residential and commercial installations alike. 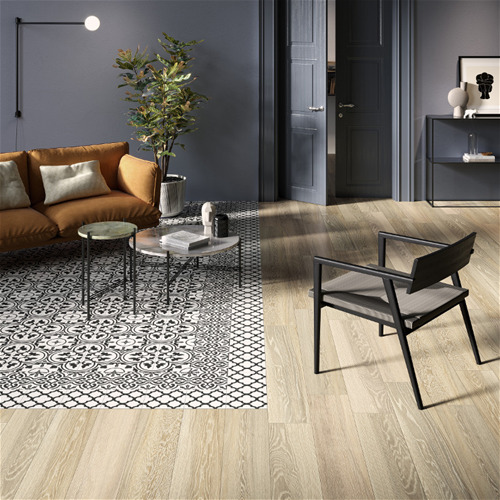 Arizona Tile offers R11 Anti-Slip Finish in four series: our wood-look Aequa and More Wood series, and our contemporary Pietra-Italia and Reside series. With several colors available in each series, the R11 Anti-Slip finish has the added flexibility to be safely used in a variety of installations. High traffic, outdoor, exposed, and wet areas can maintain the aesthetic appeal of their indoor counterparts, without compromising design or durability. With the introduction of wood and concrete-look tiles, porcelain products have continued to rise in popularity. R11 Anti-Slip finish gives a new edge to these already artistic materials giving the added appeal of endless installation applications. Using materials with the R11 Anti-Slip finish, fluid designs are now attainable allowing for truly seamless living. Founded in 1977 in San Diego, California, Arizona Tile has grown into a nationally recognized commercial and residential distributor with more than 25 showrooms throughout seven Western states. Arizona Tile imports more than 250 varieties of granite, marble, limestone, travertine, and slate. Not only do we stock over 40 series of porcelain and ceramic tile, our relationships with manufacturers allow us to develop new ceramic, porcelain and glass tile lines that are only available at Arizona Tile. Additionally, we offer over 40 colors in Della Terra Quartz slabs. Founded by John Huarte, former NFL player and Heisman Trophy winner, the company is still family-owned after more than 40 years. Our Gioia series is an Italian-made, low-fire porcelain. It features a striking, sixteen color palette and caters to monochromatic and vibrant installations alike. The durability of this material is only rivaled by its plethora of colors. The versatile range of Gioia hues give an unprecedented level of versatility within one series and accommodates traditional and ultra-modern installations. 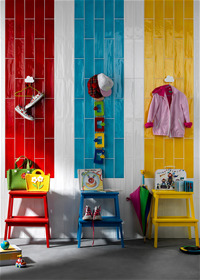 Offsetting the endless color choices, simplicity is added to the series by offering one 4"x16" tile size. This rectangular tile size taps into the classic linear appeal of subway tiles yet flaunts a modernized, elongated form. Though its rectangular shape is common, its undulated surface with varying swells and ripples creates visual interest and gives the tile added character. This twist exhibits the union of timeless and contemporary design and places Gioia on the cutting edge of tile style. Apart from its design malleability, the Gioia series boasts the low-maintenance properties characteristic of all porcelain products. It is a perfect union of beauty and functionality.